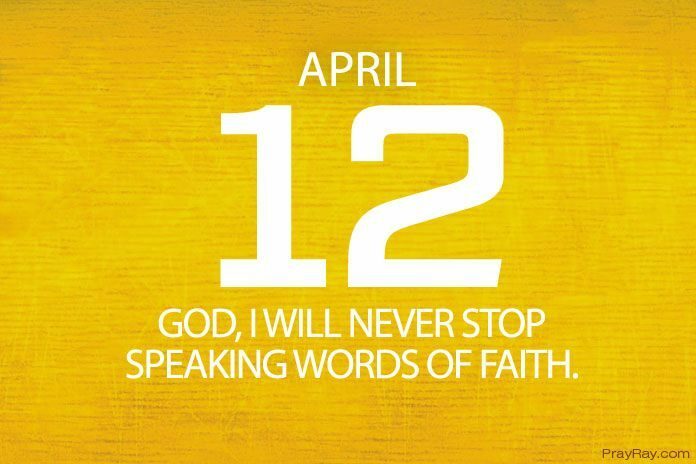 Speaking words of faith – Prayer for April 12. We have been given the power to declare a thing on earth and it will surely come to pass. When we declare anything here on earth, we must apply faith and it will happen. Let’s have faith and what we say will come to pass. It is an assurance we have in the name of Jesus that if we should speak out anything here on earth, it will surely come to pass. We have been given the authority and we must start to use the authority in Christ. We are joint-heirs with Christ, we carry the powers Jesus carries and we are not limited because Christ is our mentor. Anything we say, when faith is attached to it, it will come to pass. Promise never stop speaking words of faith, and God will be with you! All the prayers that you have prayed and the things you have asked for, everything would be answered. When you are facing a hard time, declare it over, declare victory and it will come to pass. When there was a storm and Jesus disciples were afraid. Jesus stood up and commanded the storm to be calm and it happened immediately. You can also command the storm in your job, in your business, in your family, or in your education to stop now and it will be established in heaven. The only thing required of us is to speak out, we should command with faith in God, then it will be made established. Dear Lord, I thank you for all you have done for me. I thank you for giving me the power to decree a thing and then come to pass. As I pray today in the name of Jesus, let it be established and come to pass. You are so faithful to those who have faith in you, I know whatever I say in your name will come to pass. God, I will never stop speaking words of faith. Therefore, I declare myself a success, I declare myself a victor. I can never be defeat. Everything will work out for me today. Amen.